Ubuntutu: Life Legacies of Love and Action features quilts that pay tribute to the indelible contributions that Archbishop Desmond Tutu, the first black Archbishop of Cape Town, and his wife Leah, have made in addressing human rights, advancing social justice issues, and advocating for peace in South Africa and around the world. 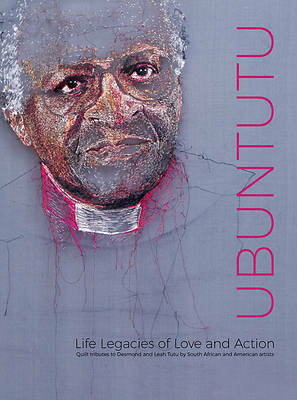 Archbishop Tutu is one of the most well-known champions of antiapartheid in South Africa and is a vigorous campaigner for many human rights causes. Leah, a founder of the South African Domestic Workers Association, has worked alongside her husband to advocate for peace and social justice. These art pieces also honor the Tutus' faith and the enduring love they have for each other. The word ubuntutu, coined by one of the quilt artists, combines the name Tutu with the Nguni word ubuntu, which can be translated as "human kindness." In the spirit of ubuntu, the quilts featured in this catalog remind us we are all interconnected. This book, which accompanies an exhibition by the same name, is a collaborative project of the Michigan State University Museum, the Women of Color Quilters Network, and the Desmond & Leah Tutu Legacy Foundation.